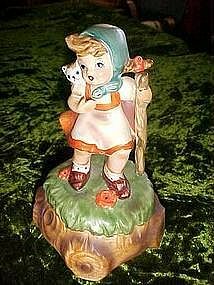 Hummel type musical figurine, plays "Tomorrow"
This cute little ceramic figurine is probably made in Japan. Made to look like one of the Hummel figurals. A little girl with a staff, and her kitty cat in her sack. Musical, key wound, and plays "Tomorrow". Lever on the back to turn it on or off. Great condition. Two holes in the bottom of the four feet. I think they are just pour holes for the ceramic. Measures 5 3/4" tall.